Creating a wordlist by indexing the hard disk (followed by an attack using this wordlist) is a pretty useful and sophisticated tool for decrypting passwords to local Windows accounts. Often users, instinctively, set the same passwords to their Windows accounts, Web, ICQ, etc. The idea of this tool is to create a wordlist of all found formerly used passwords, user's messages, words from recently opened files, etc. and then use the accumulated wordlist for looking up passwords to the local accounts. This technique is engaged in the Artificial Intelligence attack. First, select the system modules to be used when generating the wordlist. These modules find and index the following types of passwords on your computer's hard disk: Active Directory plaintext passwords, startup passwords and cached startup passwords, SQL, IIS, Windows Media, Win2K text passwords, RAS, Dial-up, VPN, DSL, WEP, WPA, FTP connection passwords, Windows Credential Manager passwords, Instant Messengers, etc. passwords. 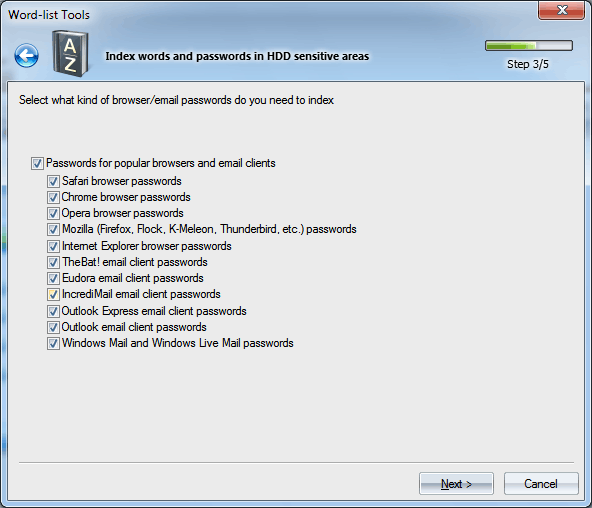 In the second part of the configuration, select the browsers and e-mail clients, passwords from which are also to be found and added to the wordlist being created. The program supports the following major web browsers: Safari, Chrome, Opera, Mozilla-based browsers (Firefox, K-Meleon, Flock, etc. ), Internet Explorer. 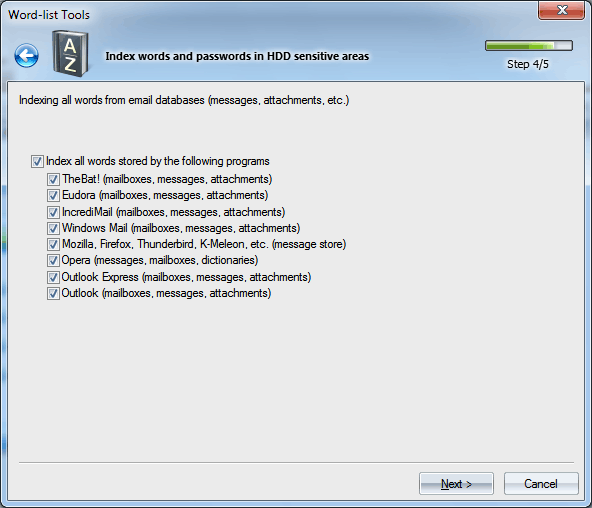 E-mail clients are represented by TheBat!, Eudora, IncrediMail, Outlook Express, Outlook, Windows Mail, and Windows Live Mail. Besides merely gathering passwords, the program can index the user's e-mail communication, scanning all found mailboxes, messages, attachments, etc. The hard disk search is performed for all accounts in a system, so the process may take considerable time, especially when the system hosts many users or when e-mail clients' databases are large. One way or the other, you can enable/disable each module individually. Set the maximum length of words that can be added to the wordlist. All words with the length greater than the specified limit will be skipped. Skip files with size greater than specified. The size is specified in MB. Use custom word delimiters. By default, word delimiters are all non-alphabetic characters. Do not index files with specified extensions. Use this option to skip files that you consider unnecessary. Clicking the Next > button starts the indexing process. Keep in mind that it can take considerable time!